Movie Trailer for "Where The Wild Things Are" (Oct. 16, 2009). Encouragement from friends on my path to publication by Don Tate from Crowe's Nest. 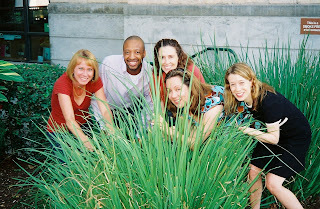 Peek: "So what's a guy like me doing with a literary agent like Sara? Well, hard work of course. But especially because of the encouragement, advice, and general goodwill I received from friends in the children's literature community — and especially Austin SCBWI." Read a Cynsations interview with Don. The Things Children's Book Writers Talk About... by Stephanie Greene at Through the Tollbooth. Peek: "I'll never forget the time I sat with a critique group of twelve at Vermont College and seriously discussed the authenticity of the 'fleaness' of the main character - a flea - in one of the writers' picture books." Hardcover versus Paperback Redux from Justine Larbalestier. Peek: "Say you have a $10 pb, that's 60c per copy. If the advance was $20,000 you'd have sell more than 33,333 copies to earn out. If your hc retails for $17, you’d only have to sell 11,764 hardcovers." Source: Gwenda Bond. Read a Cynsations interview with Justine. Print Run Set for New DiCamillo Novel by Judith Rosen from Publishers Weekly. Peek: "This week Candlewick revealed the cover art and announced a hefty first printing of 500,000 copies for the 208-page fable, in which a boy who learns from a fortuneteller that not only is his sister alive but an elephant will take him to her." Project Book Babe: "This exciting (Tempe, Arizona) event to help The Book Babe beat breast cancer will feature a panel with popular authors, as well as live music. And for a small donation, you can get sketches from published comic book artists!" Note: online auction will feature autographed books by many youth literature authors. Several authors including Shannon Hale and Stephenie Meyer are involved. The 2009 Writers' League of Texas Book Awards contest is open to American authors of books published in 2008 in the following categories: fiction; nonfiction; poetry & literary prose; children's books (short works); children's-YA books (long works). Publishers, publicists, and agents are welcome to submit books on behalf of their authors. Winners in each category receive: $1,000 cash; a commemorative award; an appearance at the Texas Book Festival on Oct. 31. Entry fee: $25. Deadline: April 30. See brochure and guidelines (PDF file). YA Authors On Twitter: a list from Mitali Perkins at Mitali's Fire Escape. Read a Cynsations interview with Mitali. Introducing the cover of Ash: an interview with designer Alison Impey from author Malinda Lo. Peek: "When I first read a manuscript, I’m immediately looking for imagery and moods that are specific and unique to the book. I try to focus on the themes that carry through the story. I usually read the manuscript once for the overall feeling of the book and a second time..."
YA Author Daphne Grab: new LiveJournal. Peek: "Why is it so hard to get back to work after a vacation? I think part of how I do get myself to write on a regualr basis is having it be a part of my daily routine: I write from 9-1 when the kids are in preschool. But anything that takes me out of that routine makes it tough to get back into it." Lori Calabrese: Children's Author: new official site. Peek: "Lori Calabrese focuses on parenting in both her personal and professional life. Her publishing credits include Boys' Life, Odyssey, Appleseeds, Focus on the Family Clubhouse Jr., Stories for Children Magazine, and The Institute of Children's Literature's Rx for Writers. Lori is a graduate of The Institute of Children's Literature and a member of The Society of Children's Book Writers and Illustrators." Recommendations Request: Books that Deal with Teen Violence from Coe Booth at The Longstockings. Peek: "What are some really good books that deal with difficult teen relationships in a honest, non-preachy way?" Free Book Stimulus Plan: Increase Your Karmic Footprint: " Wanda Jewell, Executive Director of the Southern Independent Booksellers Alliance for nearly 20 years, is overrun with books. All kind of books, galleys, advance reading copies, advance reader editions, paperbound and hardbound, slip-covered and not, limited editions, signed and unsigned, personalized and not; and finds herself overrun with books. Books here, books there, books, books, everywhere...and when contemplating the management of her extensive personal library, had her aha moment. How to weed her collection and support her southern indie bookstores at the same time? Thus was born the Free Book Stimulus Plan." Source: David Macinnis Gill. 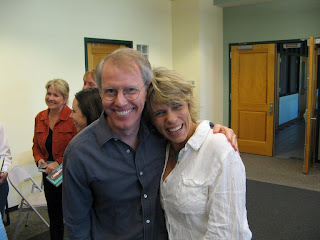 Mixing Writing & Adult Children from Kristi Holl at Writers First Aid. Peek: "Just when your days (or evenings and weekends) are blissfully free to write, your college-age children are home for the summer. They turn your precise schedule upside down. They also provide such a temptation to sit and chat and go shopping, etc. Or maybe your adult child moves back home, perhaps with small children." See also Kristi on Staying Afloat in Hard Times. Peek: "The slump eventually ended, as it will again for writers struggling in the current recession. After five years of selling no books, I sold four of my middle-grade novels in one year. If I had quit writing my fiction during that recession, I would have had nothing to sell when publishers started buying again." Knowing What Your Words Mean from Nathan Bransford - Literary Agent. Peek: "It's a blog, or, if you want to get fancy, a weblog. It's not a Blogger or a bloglines or a bloge or a blogjournal, all of which I see on a regular basis. You gotta know this stuff. You're supposed to be a word person! You have to know what jargon the kids are using!" Read a Cynsations interview with Nathan. Do you want more readers for your blog? JacketFlap is a social networking community where you can connect with more than 3,800 published authors and illustrators of books for Children and Young Adults. Read a Cynsations interview with CEO Tracy Grand of JacketFlap. From Damsel in Distress to Warrior Princess by Tim O'Leary from The Torch: Exploring All Things Fantasy. Peek: "...it is in their influence on female characters in contemporary fantasy that one can see how the legacies of Buffy and Xena truly endure. And that influence is vast." Source: Brent Hartinger. The King's Rose by Alisa Libby: an author interview from Melissa Wyatt at The YA Authors Cafe. Peek: "My agent advised me—rightly so—to cut the first 190 pages and have the story begin when Catherine arrives at court. Still, I was stuck for a while: should I start the story when she first arrives at court, or when she suddenly is noticed by King Henry? Or should it start later, when she is already the king’s favorite?" The Autobiographical Portion of Our Program from Editorial Anonymous. Peek: "Do not tell me you're writing about china dolls because you have a collection of 379 of them from around the world and they line the walls of your writing room and with them watching you, you 'never have to feel alone.'" Children's Book Press: newly redesigned website from the publisher. Peek: "Founded in 1975, Children's Book Press is a nonprofit independent publisher that promotes cooperation and understanding through multicultural and bilingual literature, offering children a sense of their culture, history and importance." Marvelous Marketer: Alice Pope (Author, Children's Writers & Illustrator's Market) from Shelli at Market My Words: Marketing Advice for Authors/Illustrators from a Marketing Consultant & Aspiring Children's Book Author. Peek: "Authors would be foolish to not create Facebook page at the very least and be proactive with it (send friends requests, update status, comment on other people’s pages, send notices and event invitations, etc.)." The Amaranth Enchantment by Julie Berry: an author interview by Emily from Homespun Light. Peek: "I don't write when the kids are awake and needing attention. I write when they're asleep, or elsewhere. I need to focus in order to write, and that's hard to do when they're here." Event Planning by Kelly Bingham at Through the Tollbooth. Peek: "We have noble intentions through our visits, and it is true that many authors do them for free. But most authors get paid, and to be frank, many authors earn up to half their annual income from school visits. So that is something to consider as well." See also Creating Your Presentation(s). Read a Cynsations interview with Kelly. Hello, spring! I hope to see some of you at 3 p.m. Thursday, April 2 at the Candlewick Press booth at the Texas Library Association conference. On a related note, I was so incredibly jazzed and honored to see the cover art for Eternal (Candlewick, 2009) included in Professor Nana AKA Teri Lesesne's slide show "Best New YA Books TLA 09." See the low-down on other Austin authors at TLA from Varian Johnson. The next day, Friday, April 3, I'll be speaking at 4 p.m. at the Barbara Bush Branch Library in Spring, Texas. The event will include an informal talk, reading, and Q&A session. The latest recommendation of Eternal (Candlewick, 2009) comes from Garden in my Pocket: "Once again, Smith has managed to grab hold of the vampire genre, spin it around her head and pitch it over a mountain." Read the whole review. What is Cynthia Leitich Smith reading? from Campaign for the American Reader: The official blog of the Campaign for the American Reader, an independent initiative to encourage more readers to read more books. What else? Writers Read: Cynthia Leitich Smith. 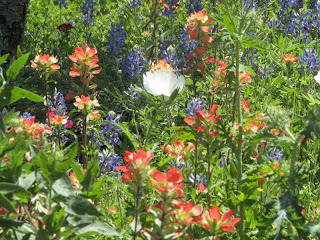 Highlights of the past week included a celebratory lunch (in honor of Eternal (Candlewick, 2009) with the Delacorte Dames and Dude--April Lurie, Varian Johnson, Shana Burg, Jennifer Ziegler, and Margo Rabb--at Suzi's China Kitchen in South Austin. Thanks, DDDs! Sadly, I was feeling under the weather on Saturday and missed two sparkling social/book events. Greg was able to go, though, and he took this picture of Laurie Halse Anderson's reception at BookPeople. 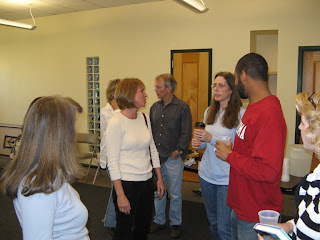 Here, Laurie is talking to Alison Dellenbaugh, April Lurie, Varian Johnson, and Carmen Oliver. You can also see Lindsey Lane and Mark G. Mitchell chatting in the background. Here's a closer look at Mark and Lindsey with Donna Bowman Bratton, April Lurie, and Jennifer Taylor in the background. 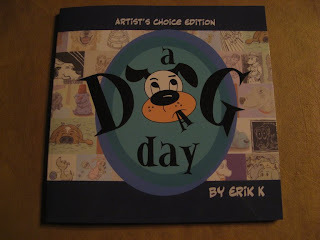 Later that night, author-illustrator Erik K hosted a book-signing party in celebration of A Dog a Day! Don't miss the documentary. 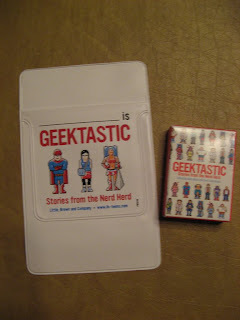 And in other news, Greg and I received these nifty promotional items for Geektastic: Stories from the Nerd Herd, edited by Holly Black and Cecil Castellucci (Little, Brown, summer 2009). (Yes, that is a pocket protector and little box of candy). Our story in the anthology is "The Wrath of Dawn." Remember my interview with publicist Julie Schoerke of JSKCommunications? 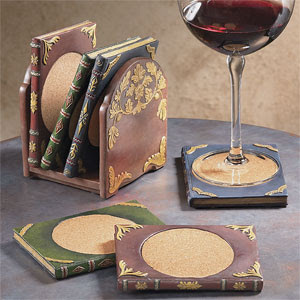 As a thank you she sent a set of six "antique book coasters" from Expressions. Aren't they nifty? Perfect for a bookish hostess like myself. Note: catalog image used with permission. The winner of Keturah and Lord Death by Martine Leavitt (Front Street, 2006) is Pamela in California! Watch for more Cynsational giveaways in the future! And that's it for me this week! Cynsations will be back online on Monday morning!